Mark your calendars now! You don’t want to miss the Grand Jubilee! We are busy working on a project to clean and restore all of the old tools in the Antique Tool Shed at WHH. Many of these farm tools and machines have been lovingly donated by Harris descendants, who cherished the memories of loved ones who had used so many of these implements for their livelihood. 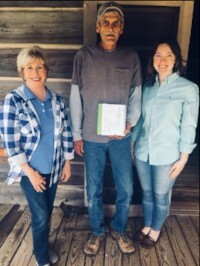 Butch Dover, Farm Manager, also contributed many “found” treasures from the farmland and saw their value for the future. We continue with this project throughout the week! Thanks to Kevin Hooper, Jane Harrison, Judy Hardegree, Janet Avant, Dotty Zazworsky, and Dixie Gallups. It’s construction week at The William Harris Homestead! We are completing two major projects at the Pavilion this week. The first is installing weatherproof vinyl curtains. Now you can rent The William Harris Homestead into the fall and winter months without fear of cold temperatures or rain! Our second project is creating a stone patio in front of the Pavilion. The stone patio will be perfect for enjoying the musical entertainment (or doing a little jig!) at Heritage Day and at other events. We can’t wait to see you boogie on down to The William Harris Homestead to check out our exciting new additions! The magical aroma of coal burning in the forge will be in the air as winter gives way to spring. 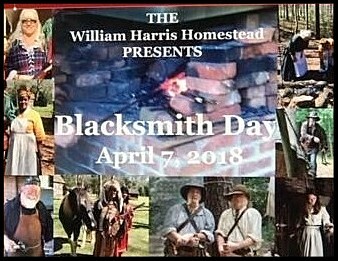 Learn how important the blacksmith was to the early settlers. As you walk back through time, see how clothes were washed, soap was made and meals were prepared over an open fire using the many tools and implements fashioned from the forge by the local blacksmith. “Heaven’s Bounty” Will be selling their famous Bar-B-Que and hotdogs, or you can bring and enjoy your own picnic on the grounds. 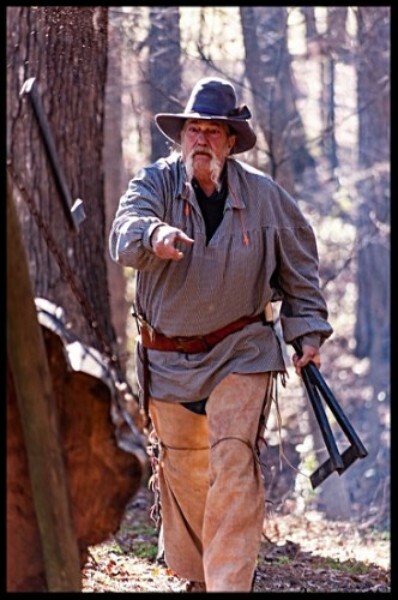 Any person wearing Frontier Attire gets FREE ADMISSION! 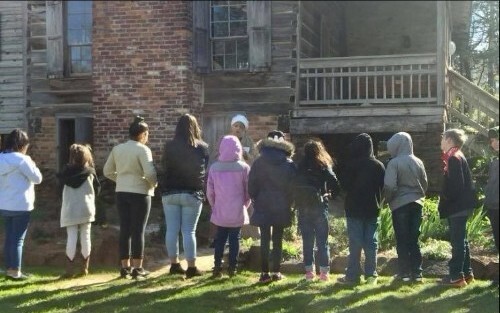 The Spring Fieldtrip Season Got Off To A Cold Start, But The Children Loved It Nonetheless! 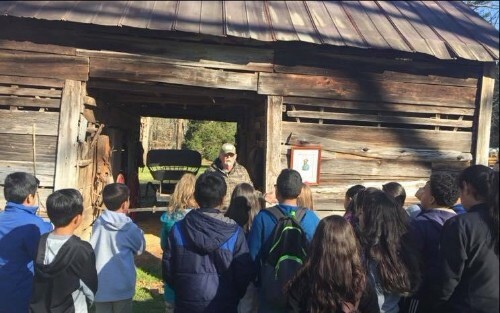 The William Harris Homestead’s field trip program, A Day in the 19th Century, kicked off the spring field trip season earlier this month. We’re looking forward to hosting school children from all over Atlanta and metro-Atlanta from now through May. Look what we dug up at the Homestead…a community garden! Emile Trahon is a Walton County Master Gardener Trainee. 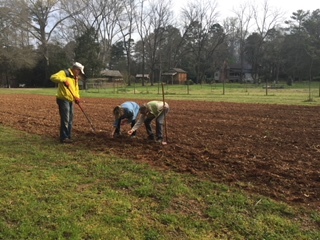 He and other Master Gardeners are installing a Homestead Heritage garden as a community project to help Walton County families in need. Emile is pictured here with Dixie and Miss Dotty. 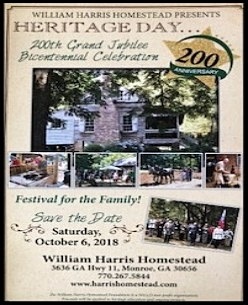 The William Harris Homestead, in partnership with Walton County’s 2018 Bicentennial celebration is planning Heritage Day…200th Grand Jubilee on Saturday, October 6, 2018, from 9 am to 4 pm. 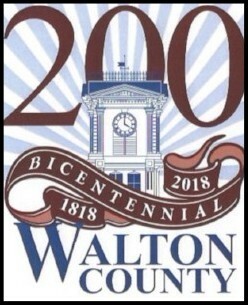 In December 1818, Walton County was formed from a sale of land from the Creek Indian Nation. Two hundred years have flown by! It is time to say “Happy Birthday” to celebrate generations of Waltonians, who have lived and loved, worked, raised families, fought in wars, and buried their loved ones. This year-long celebration will include many aspects of our history, and we are excited that the William Harris Homestead has been asked to focus on the18th and 19th centuries’ cultural, environmental, and agricultural heritage. Highlighting northeast Georgia history, Heritage Day will emphasize Native American culture with dancers and reenactors from the Creek and Cherokee nations. 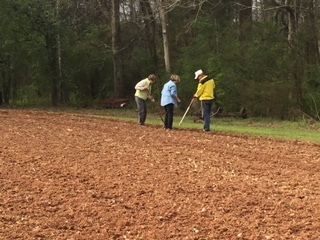 We plan to commemorate the early Georgia Militia; war veterans from conflicts throughout the 18th and 19th centuries; the Civil War; and celebrate farming practices in the 1800’s, with an emphasis on cotton production. 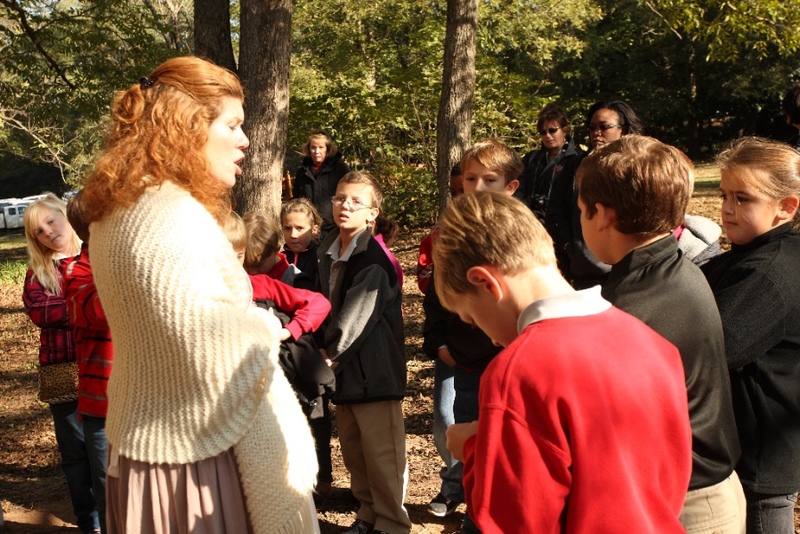 Civilian reenactors will portray everyday living in the 1800’s’. 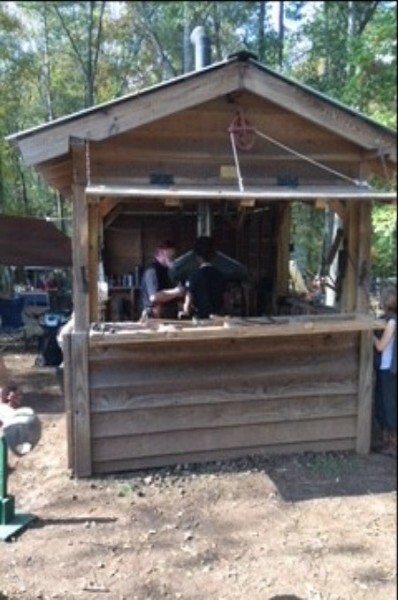 Blacksmithing, textile production, and other craft demonstrations will be on hand. There will be 19th century children’s games and activities, great music and delicious food to complete Heritage Day…200th Grand Jubilee! Pledge your support as a sponsor and become a part of Heritage Day…200th Grand Jubilee! Are you or your business interested in becoming a part of the bicentennial celebrations at the William Harris Homestead this fall? If so, please consider becoming a sponsor for this wonderful event and fundraiser! Sponsors are an invaluable part of Heritage Day and allow businesess and members of the community to participate in underwriting and sponosring some of the major expenses of the event. Sponsors may pick their favorite sponsorship venue, such as “Georgia Native American displays and reenactments of cultural history” or “19th century farming practices.” Sponsors may also choose to support the Heritage Day…200th Grand Jubilee at a variety of levels. A Heritage Day sponsorship is a great way to show community support and promote a business! All contributions to Heritage Day are tax-deductible. For more information, call (770) 267 – 5844 or email Dixie Gallups at dixie@harrishome.wpengine.com. What an unexpected treat for the William Harris Homestead! On Saturday, March 3rd, Opening Day of the 2018 season, the “Georgia Colonial Educational Team” and several of their friends will be on site between 12:00 and 2:00 pm for kids and family to have their pictures taken with them! Look for Tomahawk Hank, Gary Spotted Wolf and Mrs Wolf – from the Lakota Sioux Tribe, Black Powder Bob, Captin D’, Arlene – the Scottish Lady, Cherokee Tonya with Bo the Wonder Horse, Clarissa and her Cook Books, Churn Master Lanier Wheeler, and others! There will be NO STAFF photographer so be sure to bring your personal camera. This is our way of saying “THANK YOU” for your support of the William Harris Homestead over the years. We had a great turnout for a lovely winter day at the Homestead. We featured Clarissa Lynch, a 19th century food historian and cook, who cooked “meagre” soup, roast pork and a real fruit cake over an “open pit” fire to show cooking techniques from the 1800’s. Clarissa has a magnetic personality and everyone enjoyed the know-how and stories from Clarissa and her heritage. She has a great cookbook, too! She will be at the Homestead for a spring menu on Saturday, April 7. You don’t want to miss Clarissa! We provided cotton from our cotton patch and other natural woodsy items for impromptu ornament makings. Cotton boll angels, corn husk angels, and a variety of pinecone wreaths will be adorning many a Christmas tree in the nearby communities. We were lucky to have some awesome volunteers from Russell Middle School—Ella Ramsell, with her sister, Chloe, and Samantha Robinson—who helped with this project and received Beta Club Service hours at the Homestead. 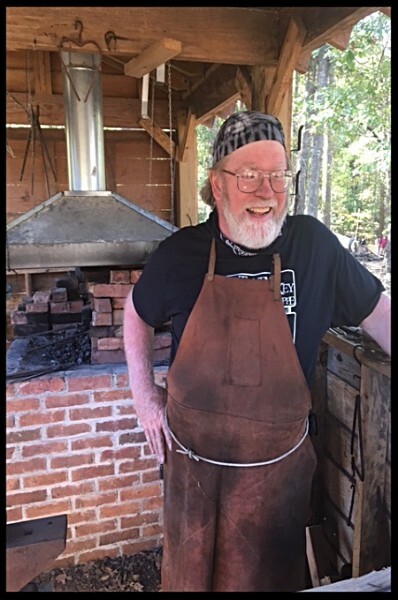 Doc was busy in the blacksmith shop with his Christmas Elf-apprentices, making wrought iron creations over the hot forge at the shop. 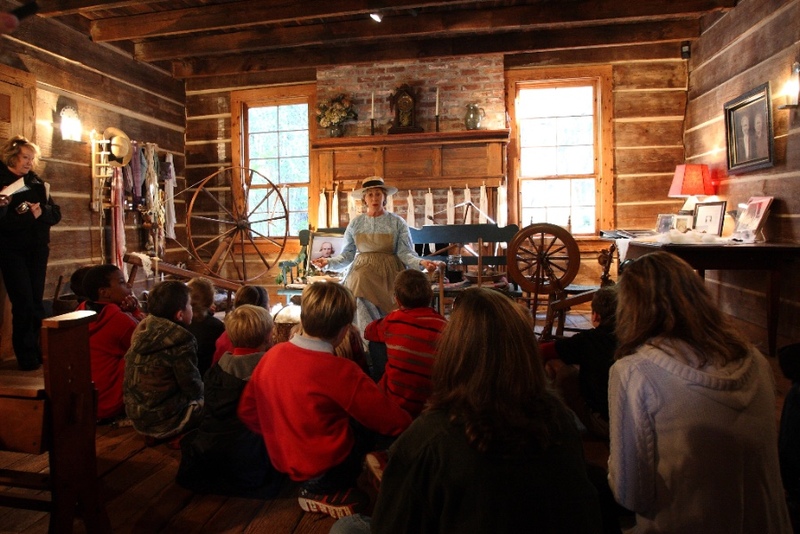 Doc and his helpers are a highlight at the Homestead…their good cheer and historic education delight all ages! Hank Gallups and Robert Dinwiddie were on hand to talk and demonstrate 18th century times…making a natural timeline of living at the William Harris Homestead on December 16, 2017…two hundred years later. Lanier Wheeler is our butter churning expert and is a favorite of us all. He will be on hand for April and for Heritage Day. Join the Lanier Fan Club! Lois and Mike Foerster were busy with weaving in the log house, dressed in period handmade clothing by Lois, our textile expert. She teaches knitting, spinning, weaving, tatting classes at the Homestead…always in high demand. We are lucky to have such a great couple as supporters of our mission at the Homestead. Dixie and Butch, Judy, Janet, Jane, Donna Sue and Dotty rounded out the Victorian Christmas at the Homestead. And always, we love Bo, the Wonder Horse…wonder where he is now…! We also love our traditional sheep…”Sheep in Heavenly Peace” to wish everyone a wonderful and magical Christmas at home and at the William Harris Homestead!